I was lucky enough to be able to visit Rome when I was a senior in high school and whenever I think of the Spanish Steps, I think of pigeons...pigeons everywhere!!! Have you seen that viceo of all of the balls (like McDonald's play pit balls) going down the spanish steps? Very amusing! Everytime I think of the spanish steps, I think of all the crowded people there! Your blog is just visually beautiful!! Oh my, that is a beautiful picture! What a great photo! 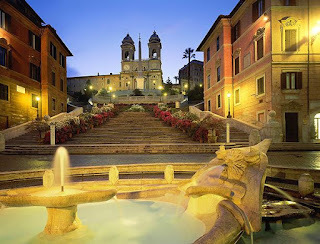 I too visited Rome when I was a senior in high school, with my family, and we stayed very, very near the Spanish Steps. They're quite amazing in person. I was there in college (longer ago than I care to think) and have the same image - pigeons. Wonderful memories. Thanks for reviving them. This is breathtaking! I absolutely love the picture. I have always wanted to travel the world and to make Rome one of my stops. This is a beautiful picture - You were so lucky to go. I have a daughter who will be a senior next year, and I could not imagine letting her go!